Mark Kellett, CEO, at the announcement of free unlimited town centre wi-fi in seven towns throughout the country. Picture: Conor McCabe. No reproduction fee. Seven town centres are set to become free public wi-fi zones thanks to a unique initiative which will give locals and tourists unlimited access to speeds of up to 100mps. Supplied by Magnet Networks and supported by local authorities and business groups, the ground-breaking scheme will see free high-speed broadband installed in Sligo, Westport, Monaghan, Knock and Carrick-On-Shannon town centres. Two further locations are set to be announced in Kerry and Donegal. The scheme, which costs the local towns nothing, involves local businesses allowing Magnet Networks to install access points on their premises, providing seamless connectivity within the town centre. Each access point in the town has a 150m range, so that users will always be in range of a high-quality signal. 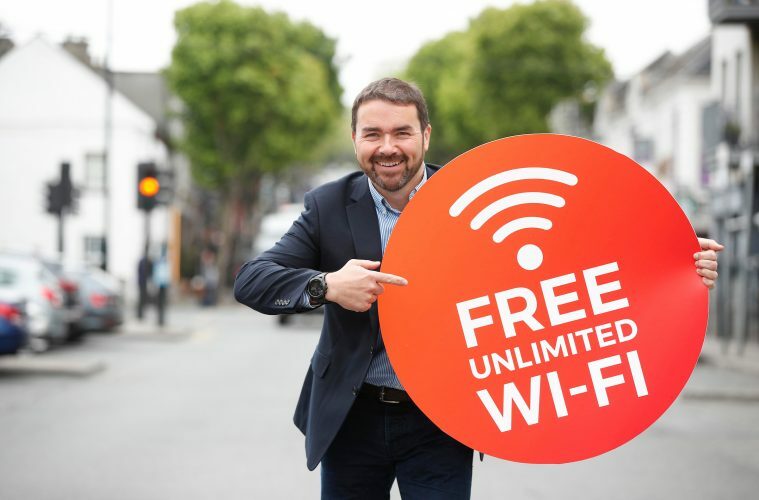 “The beauty of Magnet Networks’ free wi-fi is that you only need to register once, so tourists coming to different towns along the Wild Atlantic Way, for example, will automatically enjoy free connectivity at no cost in a range of towns,” said Magnet Networks CEO Mark Kellett. “As the project is financed by giving local businesses the opportunity to sponsor the wi-fi and send promotional offers, tourists can then be directed to attractions or places to eat and drink. “For example, if a local restaurant sponsored the wi-fi, they would be able to send out a coupon at a set time to everyone who has logged on that day giving them 10% off,” said Kellett. “This will be a great way for local businesses to stand out, which is particularly useful in towns such as Carrick On Shannon and Westport where there are so many options for tourists to choose from. “Magnet Networks has a strong track record in providing world-class wi-fi services to public spaces such as the new smart city at Wembley Park in London, and events such as the NFL games at Wembley and the X Factor finals. This initiative follows on from the success of Magnet Networks’ public-private partnership in Galway – the first of its kind in Ireland – which brought local businesses together to create a high-speed digital corridor from Spanish Arch to Eyre Square. Free public wi-fi by Magnet Networks has been operating in Galway City Centre for over a year now, and is an integral part of the city’s business and tourism offering. “Magnet Networks’ wi-fi adds to the already vibrant experience that only Galway City can offer,” said Alfie Jones, ICT Manager at Galway City Council.